Play some dolphin games, practice some tricks and learn to communicate with the dolphins! Get into deeper waters for an action-packed experience and build a more intimate bond with these elegant and graceful marine animals. Experience the euphoria that comes from a dolphin propelling you through the water on a bodyboard. Get an up close and personal encounter in shallow water. You get to enjoy a close interaction with dolphins to observe and understand their behaviour. At the same time, you can learn interesting facts about them. Get up close and personal without entering the water. This is the only dolphin interaction programme for children under the age of four. You get to learn about a dolphin’s anatomy and how to protect these joyful marine animals. 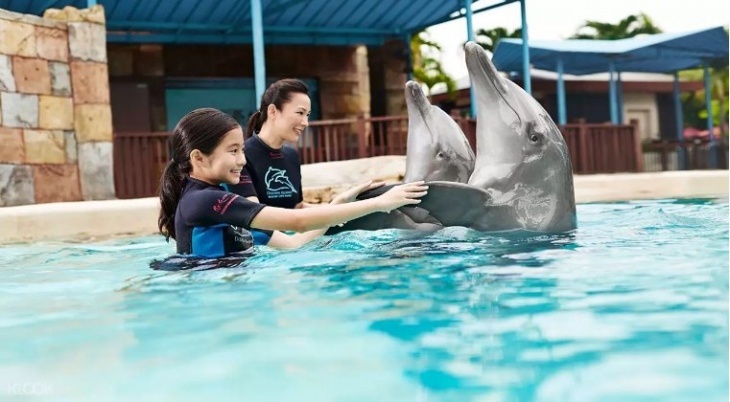 Dolphin Observer is an exclusive programme catering only to the families and friends of Dolphin Discovery and Dolphin Adventure interaction programmes participants. You won't need to get into the water! Custom-made to your preference for shallow or deep water interaction, this programme gives you exclusive access to VIP lagoons for a more private experience. Spend a day with trainers behind the scenes and learn how they care for the dolphins. You can also get to help in the preparation of meals for the dolphins.